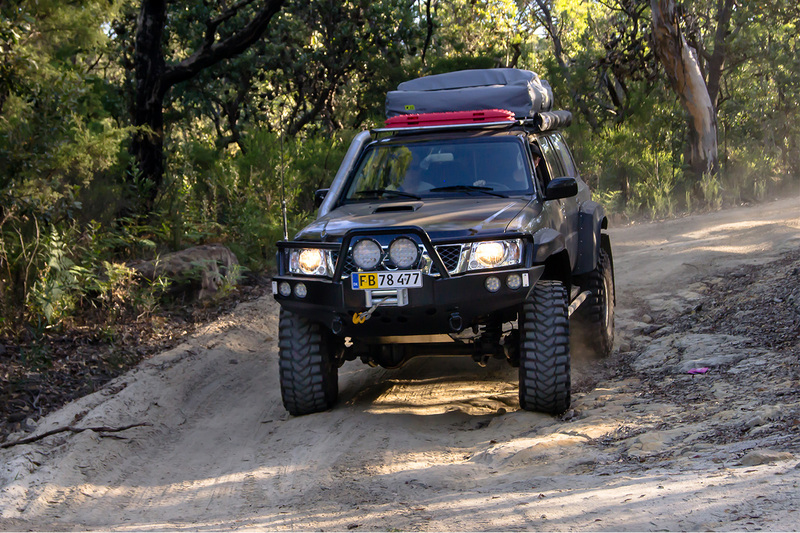 This GU Patrol hails from Denmark, but can it handle the harsh Aussie outback? A 5.9L Cummins diesel and 40-inch Treps say it can! AN 800Nm Cummins 6BT engine, 40-inch tyres and nine inches of lift… just let that sink in for a minute. While we normally focus on touring 4x4s rather than comp trucks, this one had us scratching our heads. If you run through the spec sheet, it reads like an over-the-top, competition-bred 4x4, and when you consider this Patrol isn’t even from Australia, it’d almost automatically get looked over. But it is in Australia, and right about now it’ll be parked up at Nolan’s Brook, with its owners Kim and Heidi sitting next to it enjoying a few ice-cold beers. 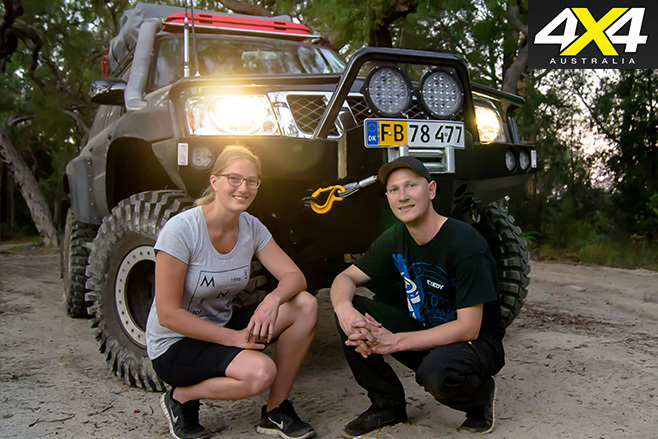 This Patrol has spent the past three years parked in a Danish workshop, where Kim and Heidi meticulously modified and upgraded every single component. This was done with the intention of shipping it to Australia to travel up and down the east coast and through the heart of the country for the better part of three months. 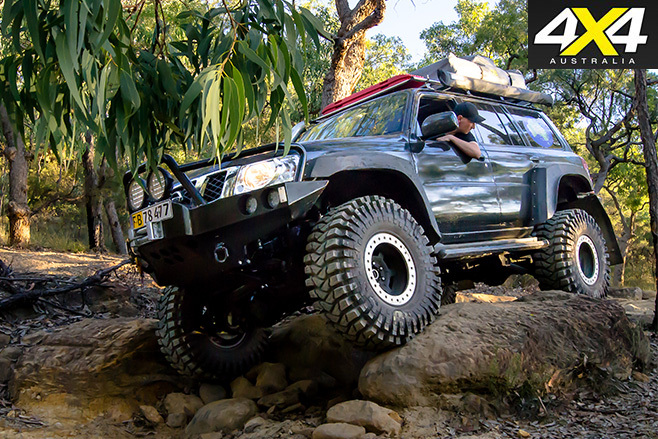 It started life as an early-series Nissan GU Patrol, with a clapped-out ZD30 sitting between the chassis rails; sills and quarter panels that resembled swiss cheese; and 31-inch All Terrain tyres. Hardly the awe-inspiring do-it-all 4x4 it is today. The plan was simple. Kim’s then-current 4x4, a SWB GU Patrol on 37-inch tyres, wasn’t big enough for the deep mud-holes throughout the Danish countryside, and it definitely wasn’t comfortable enough for a lap around Australia. Something had to be done about it, and that something wasn’t going to involve cutting corners. Starting with the belly of the beast, Kim dumped the ZD30 in the nearest skip bin. 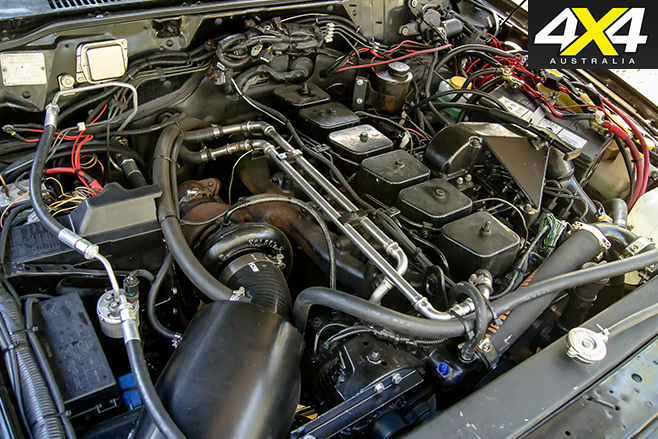 In its place would proudly sit a 5.9-litre inline-six turbo-diesel from a 1998 Dodge Ram, more commonly known as a Cummins 12V 6BT. The diesel donk now punches out 800Nm, a 25 per cent increase from stock, thanks to a re-ground fuel plate in the injection pump. Now here’s the interesting part: that 800Nm is funnelled through a custom clutch and flywheel from Australian company, Western Clutch Service, before sending power to all four wheels through the standard Nissan five-speed manual gearbox. Bolting the factory ’box to the Cummins engine required a 10mm CNC-cut steel adaptor plate and, with some custom engine mounts, it became part of the landscape in the engine bay. The sump also required extensive massaging, while an Optima Yellowtop fires the whole lot into life. While the gearbox may be stock, there’s now a second transfer case slotted in behind it for what’s known as a dual transfer case set-up. This gives Kim the option to run high-high, high-low, or low-low, for an impressive 15 forward gear ratios and three reverse. Fitment of the longer gearbox assembly required some careful notching of the factory crossmembers. 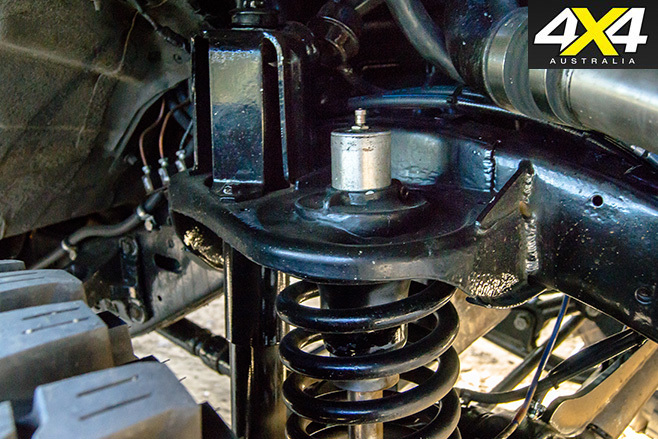 Follow the custom-length driveshafts in both directions and you’ll eventually find front and rear factory GU axles – not as over-the-top as the rest of the vehicle! Inside both diffs are 3.9:1 diff gears from Nitro Gear & Axle and a pair of TJM Pro Lockers. The 3.9:1 ratio works perfectly to keep the 6BT in the sweet spot for power and economy. In the front, the stock radius arms have been replaced with custom-made units with the addition of a second bush to help minimise the binding issue that stops most Patrols from articulating. There’s also a custom-built, high-steer arrangement and a raised and adjustable Panhard to help maintain some semblance of road handling at the new altitude. The rear is also more flexible, with the standard five-link arrangement being replaced by a triangulated four-link with adjustable uppers. While the Patrol was a bare chassis, the upper coil mounts were cut off and lowered to give the Patrol an extra 50mm of ride height. Coil buckets were fitted with dislocation cones to keep the springs seated under articulation, and Profender four-inch hydraulic bump stops were installed up front to improve the ride. Combined with the six-inch Dobinsons lift kit and one-inch body lift, Kim’s Patrol sits nine inches higher than stock. Despite the monster-truck-inspired lift, the 40-inch Maxxis Trepadors still required the rear wheelarches and rear axle to be pushed back 40mm from its stock location. The tyres are bead-locked to 17-inch ATX alloy wheels to allow Kim to drop to single-digit pressures, while 50mm wheel spacers help increase the track width to regain stability. Rather than re-fit the rusty body, Kim and Heidi picked up a GU-IV with front-end damage and some trick leather interior. A new radiator support and some dent-free new panels gave the Patrol an updated look. The body and chassis received a full respray before coming together, with custom-made flares covering the rig’s massively increased width. The couple has decked out the interior with all the required gear for serious outback travel. 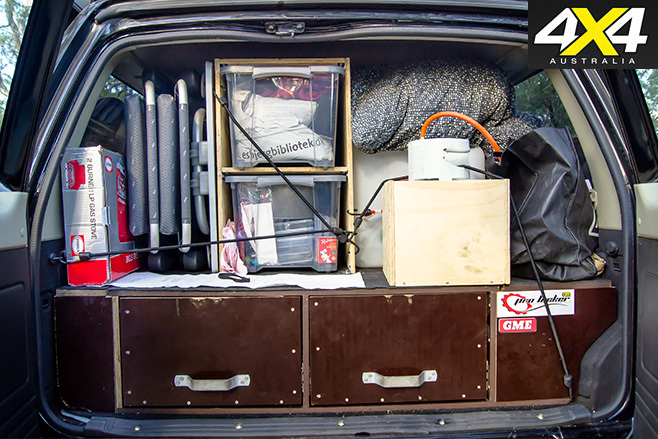 There’s a cargo barrier installed behind the front seats, a set of timber storage drawers, a pair of Waeco fridges, and three months’ worth of camping equipment. The final piece of the puzzle before the long haul to Australia was a full set of custom-built bar-work. The front was painstakingly pieced together from flat plate, and it houses no less than six LED driving lights, a 12V winch wrapped in 12mm wire cable, and the UHF aerials. While Kim was fabricating the rock sliders on either side, Heidi’s father fired up the welder to build a rear bar that was tight enough to get through narrow tracks and strong enough to hold up to the abuse of extended travel. Plus, it supports a 40-inch Trepador spare. 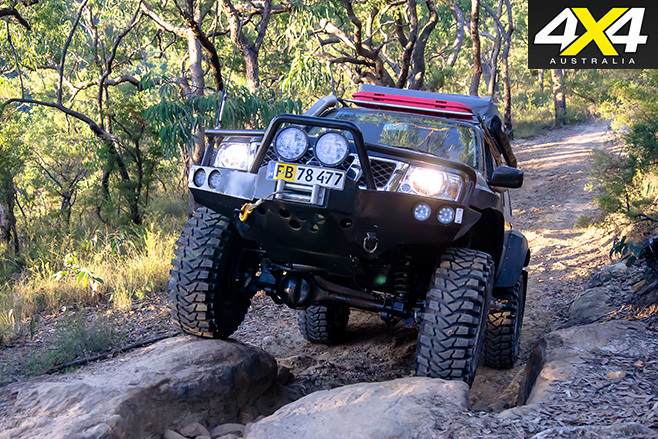 Kim and Heidi’s Patrol is a do-it-all kind of 4x4. 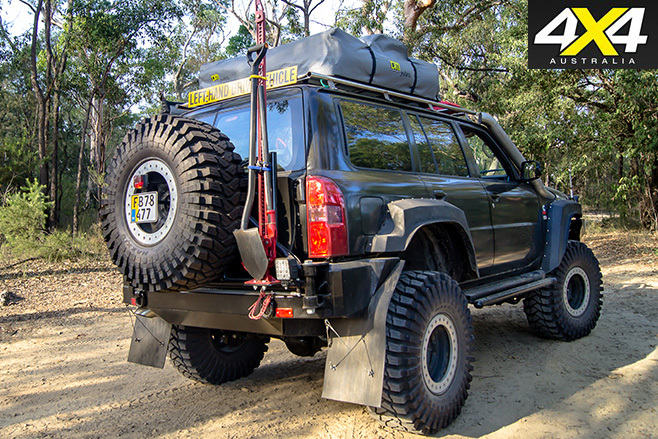 Some well-thought-out modifications, the right know-how, and a little cost saving where appropriate have built a 4x4 that won’t only drive over whatever they point it at, but it’ll do it on any continent they ship it to. YOU may be wondering how Kim and Heidi are able to legally drive on Australian roads with 40-inch tyres, nine-inches of lift and wheel spacers. Australia offers a few different methods for international travellers bringing their own vehicles to our tracks. The first and most obvious is a temporary import permit. However, the most commonly used method is a Carnet de Passage en Douane (CPD), which essentially functions as a passport for your vehicle. To be eligible, the vehicle needs to pass a basic safety test in Australia and be insured with third-party property damage at a minimum. International travellers are also required to bring with them registration papers from their home country. Once here, the vehicle can only be driven by nominated drivers and must be exported before expiration of the CPD. The best part is, we can use the same system to take our vehicles overseas.